Natural materials can be classified in geological materials and biological materials that are connect by water: rock – gravel – sand – clay – water – grass – bamboo – palm – conifer – broad-leafed trees. Geological materials are borrowed from the earth and will eventually return to the earth. Biological materials are pulled out of their life-cycle and susceptible to temperature, moisture, bacteria and fungus. A list of minor materials ads on: natural tar, gums, saps, shells, resins, beeswax, plant and animal oils, wool, skins and others. (Evans 2002: 15). Hence, a tree cut down on site -whether with a chainsaw or a hand saw- and milled square is still a natural material because of the personal involvement in the process and the respect for the tree. If a lumber company clear cuts a forest and hauls away the trees on a big truck, “the wood’s naturalness diminishes drastically”, says Ianto Evans (2002:14). In the following, we will focus on the most common natural building materials: clay, sand, and straw. Clay is the most complex and critical ingredient of our building materials. Building soil or loam is not a standardized material, but a mixture of clay, silt and sand and can also contain bigger particles like stones and gravel. Different clays have different characteristics and therefor it’s essential to understand the properties of clay and modify it by additions if necessary. Clay is decomposed rock, it is made up of little platelets of hydrous aluminum silicates and held together by water molecules (Evans et al. 2002: 121). 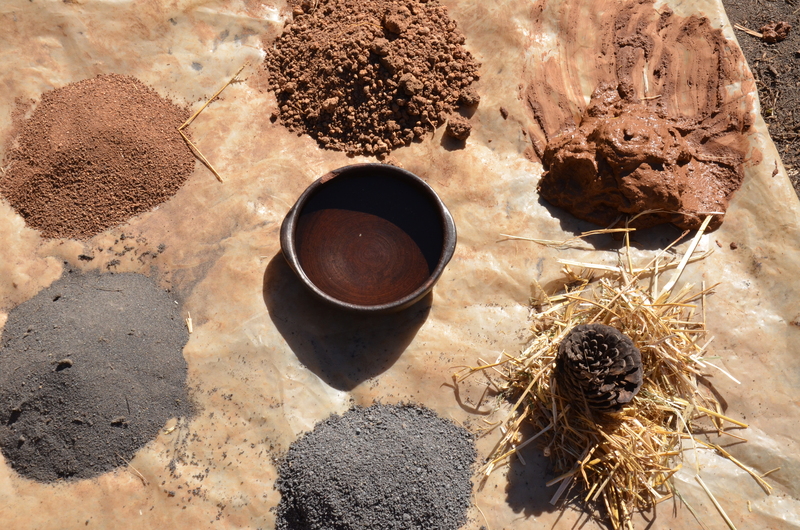 It’s not only the size that distinguishes clay from other “dirt”, it’s also its molecular and chemical properties. Clay particles are electrically charged what makes them adherable and attractive to other molecules like water. There are strong cohesive forces in clay. Since the particles are much smaller than those of sand for example, there is more surface area for water to adhere. The crystalline structure of clays share a code that is supposed to be similar to that of DNA, the building block of life. Clay might have been one of the prime ingredients of the “primordial soup” in which life originated (Denzer 2007: 24). Also in the Book of Genesis, God created Adam out of clay. When working with earth as a building material, you face 3 main challenges, in comparison to conventional building materials: First, clay is not a standardized material and needs to be tested before use. Second, it can absorb a lot of water and it shrinks 5 – 15% when it dries, leading to cracks if there isn’t enough sand added. Third, earth is not waterproof and must therefor be protected from rain and frost (if wet). Binder. Clay is the sticky glue in our mix, it is the bonding agent. If you compare your building mix with a rock wall, clay is the mortar and sand is the rock. It’s the clay, that holds your materials together. Since clay isn’t a standardized material, it’s necessary to test your material before using it. It’s also important to be able to differentiate clay from silt and other slippery organic matter. There are no rules and no recipes for your mix. You need just enough clay to hold the wall together. Calculated over the thumb, you need 1 part of clay for 3-4 parts of sand. Straw is added in later as needed. Particle Size. Clay is a very fine material, it’s size is less than 1/256 mm. Clay particles are very small but have a large surface area and a single gram of clay can have a surface that is larger than a football field (Denzer 2007: 25). Viewed under the microscope, clay is a series of tiny plates, held together by water molecules. Clay’s tendency to bond with water makes it sticky. Also the flatness of the particles creates its plasticine-like and sticky properties, comparable to two sheets of wet paper. When you make the shake-test it takes coarse sand less than a second to sediment, a grain of silt a few minutes, but a fine particle of clay can take hours to years due to its shape. Breathability. Clay has the ability to absorb and release moisture. If there is too much humidity in the air, the wall absorbs and releases it again, when the air is drier. It naturally regulates humidity in your building, what makes it a perfect material for building! It also absorbs heavy metals, toxins that are in the air or in your skin. Healing. Clay has been used for thousands of years for its medicinal properties. Externally it can be applied on irritations of the skin the extract toxins. Mud baths are a common use of clay and offered in health spas. Internally it absorbs toxins in the stomach. Impermeable. Water cannot penetrate heavy clay and makes it a suitable and natural option to seal ponds and damns as long as they don’t dry out! Memory. Clay remembers its form. Clay remembers the stories of the planet. I have heard a few people talk about clay having a memory. If you have experience with that, please share it with us! Sand is a very stable material that gives your wall compressive strength. Sand is an essential ingredient in cob building. The addition of sufficient sand in your building mix is one of the options to avoid cracking. Sand does not hold moisture and interlocks with each other as the clay dries. Since sand is essentially like rock or stone, it has good thermal mass properties. It stores heat or coolth. Sand is crushed rock, broken down either mechanically with the use of machinery or naturally through the action of waves, rivers, wind or glaciers. In order of suitability, you would first choose finely crushed rock, glacial sand, river sand. Sand that has been tumbled around a lot is rather round and less suitable for building, like beach or river sand (Smith 2002: 123). It’s preferrable to use sharp sand because it interlinks with each other whereas round sand behaves like marbles, they never really want to stay on top of each other. The round particles of beach sand are more likely to slide off each other. You would also have to wash off the salt before using it. Straw is the biological material that is used in cob building. Straw is a byproduct of grain production. It’s the stalks that are left over, after the cereals have been harvested. There is not a “stitch of green” or nitrogen in it any more. Bugs and critters are not interested in straw, because there are no more nutrients, it’s similar to biting into sawdust. Oat, rye and winter wheat are the strongest straws you can find and your best choice, barley straw is ok too but can be bridle. Straw that has been grown over winter is stronger than straw that was grown in spring and summer. Rice straw is good too, it is very long and has very good tensile strength. It can be tricky to mix with your clay and sand since it tends to entangle around itself and is also very sharp and can cut your hands and feet. Combine it with a shorter straw, eg. short wheat straw (Smith 2002: 128f). When you buy and store straw, make sure that it hasn’t gotten rained on, that it had been stored in a dry place. Yourself, store it in a dry spot off the ground, indoors is best. Avoid straw to get moist as it will rott and get bridle, tarps are not perfect as a cover. They might leak and cause condensation. Buy your strawbales directly from the producer, that’s cheapest and the most reliable source. Test the straw for its strength, try to break it and pull it apart. The price of strawbales fluctuates throughout the year and it’s best to get them right after harvesting. Hay is not straw. Hay is grass that was cut green and then dried. It still has a lot if nutrients in it. Just as it was starting to make its flower or fruit, it was cut. That´s the point, when it has most life energy in it. Hay is intended to be animal fodder during winter. whereas sand gives your wall compressive strength, straw is responsible for the tensile strength or pull-apart-strength and for the shear strength of your wall. Straw in a cob wall is like the rebar in reinforced concrete. Take 5 good stems of straw in your hand and try to pull it apart. If it is good straw, you should not be able to break it. Straw insulates. Straw is an insulating material as it traps air in its hollow stems. Straw reduces and disperses cracking. Like sand, straw is an aggregate that avoids cracking as clay dries. Straw is a structural element in strawbale construction. A good plaster is essential in strawbale construction. When you use a good plaster with sufficient straw, it’s not necessary to use pins in between the strawbales as the plaster does the same job. (Sara Highland in Oxford, Michigan, July 2012). Straw has different lengths. Depending on what you do, sometimes you want long straw, sometimes you want short straw. For Cob, you prefer long straw to make you wall as strong as possible. For structural plasters, you might want medium long straw and for finishing plasters you will prefer finely chopped straw. Design your building depending on the materials you have! Evans, Smiley, Smith (2002): The Hand Sculpted House. Chelsea Green Publishing Company: VT, USA. Denzer, Kiko (2007): Build Your Own Earth Oven. Janell Kapoor, Kleiwerks International: Talk about natural building materials at Ecoescuela El Manzano, Región del Bío Bío Chile, March 2012. Sarah Highland, Highland Artesan: Talk about building with strawbales at Strawbale Studio, Oxford, Michigan, USA, July 2012. “A Permaculture Design Course Handbook” by TreeYo Permaculture is licensed under a Creative Commons Attribution-NonCommercial-ShareAlike 3.0 Unported License. Wow. Thank you for such an educational resource! My eyes are opened to the power and natural strength of sand, clay and straw. Thank you. Thank you. Thank you.